Free admission for a limited time to visit the world-class art! LOS ANGELES, CA, March 14, 2017 /24-7PressRelease/ — Located in Covina, H.H. Dorje Chang Buddha III Cultural and Art Museum is the largest art museum in East Los Angeles County. It was opened in 2014 and has a collection of over two hundred pieces of art, including western paintings, Chinese paintings, calligraphy, poems, hand-painted tiles and marbles, as well as a unique style of sculpture called Yun Sculpture, which was never seen before in the world, all done by H.H. Dorje Chang Buddha III who has also independently originated sixteen unique schools of painting. The art by H.H. Dorje Chang Buddha III is considered world class. For example, the ink-lotus, was sold for 16.5 million US Dollars in the 2015 Spring Auction in New York, setting the highest record price in that auction and making it the price leader among art works by all living artists. The Carp in a Lotus Pond set a price record for limited replicas with each copy sold for three hundred seventy-nine thousand and five hundred dollars in the international art auction market many years ago. In the painting Dragon Carp Frolic in the Lotus Pond, the fish, lotus, water, flowers and watergrass all show spirits that are unforgettable, as is the tremendous force brought out by the brushwork. This painting was appraised for 59 million Dollars ($1,978,500 per square foot) by a reputable and legally certifiable appraisal company at that time. That painting is open for replication to public, and someone offered to purchase the copy if it is replicated successfully from the original painting for very high price. However, no one has yet been able to successfully replicate it so far. As can been seen, it has indeed reached such a great level! The offer is still good today, and anyone who is interested in replicating it is welcome. What is the most applaudable is the several super-tridimensional Yun sculptures on display in the museum by H.H. Dorje Chang Buddha III. Some are grandiose and others are delicate, but all look as though the energy of the universe is flowing and changing. Yun sculptures are unique in the world. There are only two museums in the world where they can be viewed and H.H. Dorje Chang Buddha III Cultural and Art Museum is one of them. As a non-profit organization, H.H. Dorje Chang Buddha III Cultural and Art Museum does not only display and promote art and culture by letting public visit for free, but also work to provide charity services of all kind in the community – including periodic visits and donations to senior centers, centers for abused women and children, handicap centers, centers for autistic youths, orphanages and other social service organizations. It also donates to and support local police and fire departments. Besides, the museum holds periodic art contests and displays, provides scholarships to students and encourages youths to make creations in art and culture. These social services have won the museum critical acclaims among all levels in the society. Visitors to the museum not only are surprised by the wonderful beauty of the art in the museum but also leave with beautiful, blissful and happy impressions. They unanimously leave great comments and the highest ratings for the museum on Yelp, and as such Yelp specially presented H.H. 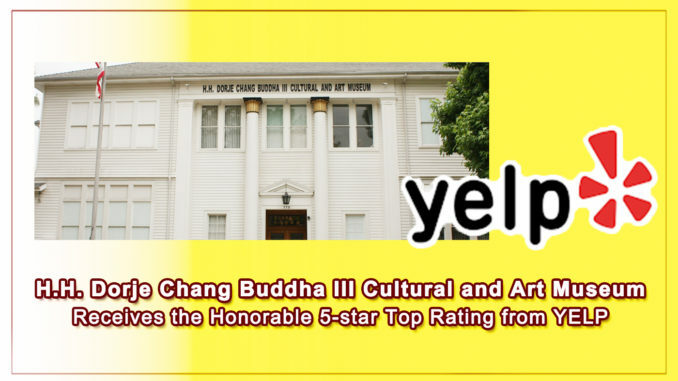 Dorje Chang Buddha III Cultural and Art Museum with its highest 5-star congratulatory award. The meaning it represents is that visitors all like the museum very much, and the precious treasures of the museum let people appreciate the beautifulness of art. For more information, please call (626) 281-6378, or visit hhdcb3cam.org. The H.H. Dorje Chang Buddha III Cultural and Art Museum in Los Angeles County, California, U.S.A. is a completely new cultural and art museum located in a famous 114-year-old two-story historic building that has been redesigned and remodeled. The Museum has a rich collection of beautiful ink-wash paintings, oil paintings, calligraphy, sculptures, and other forms of world class artistic treasures. Most works of art displayed at the museum were created by H.H. Dorje Chang Buddha III and represent a tiny fraction of His overall accomplishments in thirty main categories. H.H. Dorje Chang Buddha III is the highest leader of Buddhism in the entire world and is the recipient of the 2010 World Peace Prize Top-Honor Prize. The H.H. Dorje Chang Buddha III Cultural and Art Museum is an independent non-profit organization under IRS 501C(3). H.H. Dorje Chang Buddha III does not have any shares of ownership or property rights of the museum, nor does he take any position in the museum or participate in any operational management or decisions of the museum. For more information, please call (626)281-6378, or visit hhdcb3cam.org.